This is my review of the incredible Focal Sopra No 2 floor standing loudspeakers in gloss Carrera white and henceforth known as the stormtroopers in this household. A review, in critical terms, seems to me to be hardly necessary, for me, these speakers, paired with the Naim NAP 250 DR, are my audio nirvana. In June last year I was invited to the launch of the Focal Sopra No 3 floor standing loudspeakers at KJ West One in Marylebone. They are huge and imposing, totally impractical for everyday homes, but nonetheless astounding in their presentation. Driven by the flagship Naim Statement pre and power amplifier this launch was an insight into a near £300,000 system. But how can anyone get to this extraordinary performance? Well, with the Focal Sopra No 2, a Naim NAP 250 DR and the Naim NAC-N 272 and a bunch of Atlas Mavros cables and interconnects, we are getting to a system that is a fraction of that cost of the Sopra No 3/Statement set-up. This set-up is no less impressive and it is in my front room. When I had the opportunity to review the Naim NAP 250 DR, ahead of my own 250, it was quite clear that my KEF R700s, as lovely as they are, were struggling with the power and precision of the DR upgrade. I was offered the opportunity of trying the Focal Sopra No 2 by Naim (Naim and Focal have the same owners now) and it was just too hard to say no! One of the ‘problems’ I have had these last few weeks is actually sitting down to review these Focal Sopra No 2 stormtroopers. The actual problem is by the time I have sat down and played around with them, I have burned another two hours of time simply playing any and all forgotten or new music. This probably says it all when it comes to listening to these speakers because it is so pleasurable and effortless. It also puts a lie to claims by some of ‘ears bleeding’ after prolonged Naim listening. In the end, I decided that the only way of completing this review was to listen as critically as possible, whilst going on and on about the music I was listening to as well. Tough job. The speakers turned up a week or so before Christmas. The packaging was substantial and huge, outdone only by the Avalon Transcendent’s packaging, which resembled the Arc of the Covenant being delivered, in a wooden framed box! The Focal Sopra No 2 weigh in at 55kg each, they are an imposing 1.2 meters tall and over 50 cm deep. On set-up, my Naim dude put them in their optimum position, which ended up being a quarter the way across my 4.5-meter deep room (though the room width is larger and wider) and, slightly worryingly, in front of the fireplace to the sides, not good in winter. I could have done with another meter or so of depth I suspect but this was fine. Practically, in the end, I have ended up sliding the speakers back on their fitted plinth back behind the fireplace hearth for everyday use and shifting them forward to their ‘mark’, screwing down the fitted spikes to contact the wooden floor on critical assessment. As with much technology, innovation tends to trickle down to the man on the high street from the highest level, the Sopra No 2 is no exception. Like Formula 1, Focal’s learning from its flagship Utopia product range is trickling down and the Sopra No 2 benefits from this. For example, the tweeter is made of Beryllium, it is light and is low density, stiff and has excellent damping qualities, this presents a very clear and precise sound. The housing for the tweeter is a horn shape, emanating from behind the driver which ensures air pressure is removed from the tweeter area more efficiently, allowing the tweeter cone to recover better; this horn shape gives the signature look for the Sopra range. The midrange driver/cone setup also benefits from trickled down technology from the Utopia range (the Diabolo). It uses computer simulation technology that has enhanced the mid range output. With reduced resonance due to a lighter surround the and a reduction in mass the ‘TMD’ midrange unit delivers enhanced frequency response, improving the clarity of the soundstage. Overall the look of the Sopra range produces an angled top on the speakers which means, much to my liking, there can be no candles on top of the speakers! A very positive point indeed. 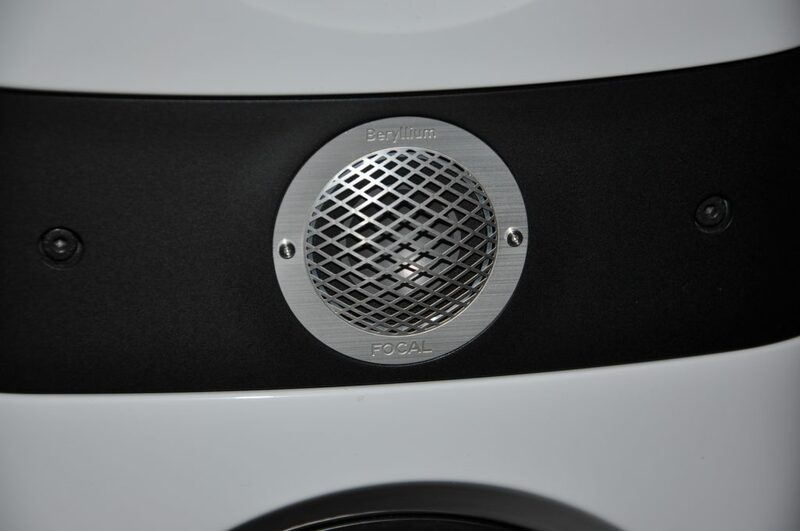 The speakers ooze quality and have lots of very nice detailing, engravings on the front and back and an understated logo on the front, the squiggle. 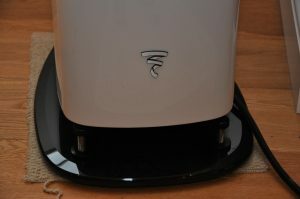 My review speakers are in Carrera gloss white so they are not exactly subtle in our classic ‘Farrow and Ball’, very ‘English’ front room, hence the Star Wars ‘stormtrooper’ label. The range comes in an even less subtle Electric Orange as well as black and the like. I have not got the grills, which I gather are magnetic and they may have eased the aesthetic impact. I’m really appreciating the small details, especially the engravings front and back of the tweeter horn. As I have already intimated, my review system is a fairly mid/high-end presentation (it is all relative), comprising a Naim NAP 250 DR power amplifier and the Naim NAC-N 272 preamplifier, streaming client (networked). I have Atlas Mavros cables and interconnects and two Atlas Eos power cables to the NAP and the NAC. My sources are mainly from the Naim Uniti Server (the old one as it is now) with a hard wired interconnect and from a Michell TecnocDec with a GyroDec platter upgrade and the power supply upgrade. 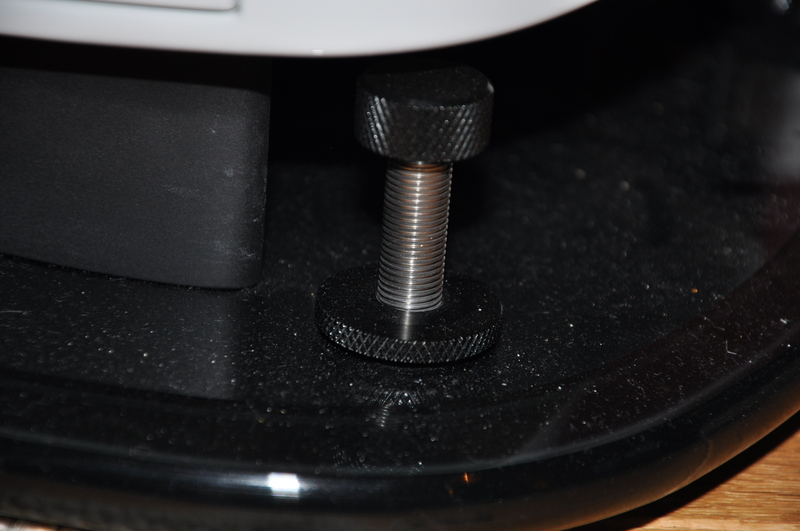 I’m using a Rega Phono stage and a Rega Exact cartridge on the Technodec. I’m also a big fan of Tidal’s service and this is the main source of my musical distraction (and I now have a 48 song Ryan Adams Top 10 playlist!). I also use a USB stick of 24-bit selections for my own reference. I hardly know where to start, I think I will just need to focus on what I can hear rather than going about how everything sounds amazing. The first thing to say is that they sound great from 5-50 on the digital volume scale on the NAC (out of 100). Beyond 50 is too much for me but the sound output is so tight up to very high volume, from Justin Timberlake (Pop) to Skrillex (EDM) to Beethoven this is an incredible, unmessy set-up. At low volume, which I use frequently for background, reading purposes, etc. there is a bass line control that is clear, peaceful and noticeable, which obviously defeats the object of low-level volume. Listening to the soundstage, specifically, this is the strongest image I have experienced in my time since my Avalon Transcendent experience (twice the price, driven by the T+A HV series). Just to draw some comparison, the opening of the audio demo classic ‘Strong’ by London Grammar is simply epic and sternum grabbing. The depth is clear and the soundstage wide. It is wonderful. When my Naim dude left on the setup day, I just played Radiohead’s ‘Pyramid Song’ at least five times back to back, such was my love for the song and this soundstage. Overall, there is a clarity and width to all of the music that I have not heard for a while, it is incremental but definitely there. In respect of dynamic range and channelling, listening to Pink Floyd’s Money reveals perfect channel separation. I have discovered Aphex Twin these last few weeks owing to the forgiveness of the Sopra No 2s and if you want to stress your system I can think of no better music to listen to. Dynamically varied these speakers, of course in concert with the amplifier, are very happy delivering their most complex music, with their fast delivery and recovery characteristics. Rhythm and timing wise, I always struggle to describe rhythm and timing between systems. However, if this is about delivering a clear and precise note, beat on beat, these speakers are always ready for the next beat or phrase due surely to their precision. So, as it seems to me, Cee Lo Green’s ‘Bright Lights, Bigger City’ bounds on effortlessly with no lag in pace, or interference from the previous note. It is unfussy and clear, this is very impressive and is likely a function of the precise performance from the Beryllium tweeter, the horn-shaped housing, and the delightful midrange enhancement from Focal. Knife Party’s ‘Bonfire’ is another example of the perfect rhythm and timing demonstrated by these speakers, particularly ‘at volume’. Awesome; indeed, I would suggest that these speakers are excellent for EDM and thumping Pop music (not necessarily an endorsement Focal would like but compared to some others this is no mean feat). Listening to the tone of these speakers, in combination with the 250 DR, there is stunning precision to most instruments. The bass control in Damian Rice’ ‘Blowers Daughter’ is the best I’ve heard, this such a complex piece of music and it is sometimes hard for the bass to be controlled well, here it is ‘studio’ perfect. So too with Massive Attack’s ‘Unfinished Symphony’. The piano on Coldplay’s ‘Everything’s not Lost’ too is perfect, and I have countless notes of other tracks where the snare drum and violins and the like are pitch perfect (to my ears). And finally, of course, there is the resolution. It is time for the men against boys phrase. There is such precision here it hard to describe, but it is near perfect. Many more regular readers will know how much I listen to Ryan Adams’ ‘Carnegie Hall’ recordings and they have honestly never sounded better or clearer, or crisper than this, the detail of the foot on the pedal in ‘Sylvia Plath’, the cough in the audience at the back left of the soundstage presentation is simply the best there can be. With the vinyl copy and the lights off, there is a feeling of being in the moment with the audience. Other notable recordings I have played to hear the detail in the music include Tracey Chapman’s ‘Behind the Wall’ (stunning vocal only), and James Bay’s ‘Scars’ with his precision strings, wonderful. I am bound to say the Naim power amplifier is surely the perfect partner for these speakers. I had a brief insight into higher end performance with a Denson power amplifier (I can’t recall the model, maybe the B-310) in a similar set-up a few years back. This was the point when I realised that pre and power amplifiers were the way for me to radically improve my system, particularly at the lower end of the range. Obviously, I have Naim goggles on and I just want these speakers forever, in white, orange or just about any colour going spare. It is hard for me to think how much better this setup could be, I guess a Naim XPS managing the power to the NAC will add further but this really is heaven for me. 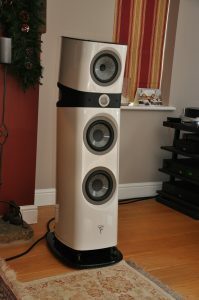 I’ve had the T+A Criterion TCD 110s and 210s speakers and they were stunning driven by the T+A HV series. The HV electronics are simply top drawer. I have also experienced the Avalon Transcendent speakers with the same HV electronics and they too were stunning, probably the best I have experienced domestically. But the Sopra No 2s seem to be so accessible in size (relative to the Sopra No 3s, TCDs) and price (relatively) and I just feel the combination with the 250 DR is seamless and comfortable. I am bound to mention my recent experience with the Moon electronics which were softer and easier to the ear and a tie up with these speakers would be interesting indeed on the same playing field. This experience has left me wondering if I have reached the end of a journey to find my audio nirvana, with Ryan Adams ‘Live at Carnegie Hall’, I think I probably have. My main takeaway from this experience will be the effortless delivery and clarity from this system. It is going to be quite interesting to see how I get on with the KEFs after the Sopra No 2s go, tomorrow. FOCAL Sopra N°2 Loudspeakers have been in my system (Adcom GFA-5802 power amp, Audio Research LS28 preamp) since September 2017. The synergy between these components is absolutely amazing . Hard to turn off & attend to other matters. My Sopra 2’s are currently paired with a Devialet D250 after turning my back on Naim. This is the best my system has ever sounded. A remarkably natural and dynamic speaker, large scale sound and superb soundstage. I have a Naim Uniti Core. 2TB SSD HD, plus my old Uniti Serve SSD connected to Devialet DM400 LE Amps with Isotek Sigmas power conditioning, connected to Focal Sopra 2 Speakers with Chord Sarum Cables and I agree that the sound is fabulous and is perfect ‘for my listening room (W 4m x L 5m x H 2.4 m) and also find them very natural and dynamic with large scale sound and positioned for perfect soundstage, particularly for the price (value for money). I frequently get told by my partner that she can hear/feel the base through the walls at moderate volume levels (-16db) even with acoustic sound deadening internal wall insulation and Vicoustic accoustic room treatment (3 cnrs Wavewood Diffusers in corners, 6x Cinema Rounds on side walls & polystyrene multiuser DC2’S behind the speakers/central component rack). Perfect home speakers for a dedicated mid-income audiophile.